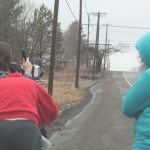 HAROLD MERVINE WALK & TALK IN CENTRALIA- CUT FROM FILM. 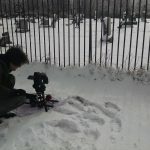 ANDY OSTROWSKI IN DEPTH INTERVIEW – CUT FROM FILM. 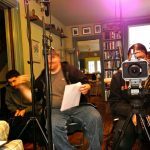 WILLIAM KLINK INTERVIEW- THIS ENTIRE INTERVIEW WAS RESHOT A YEAR LATER IN HIS LIVING ROOM AFTER PRODUCERS DISLIKED THE LOOK OF HIS INTERVIEW. 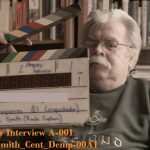 EDITORS HAD TO RECUT HIS NEW INTERVIEW BACK INTO THE FILM LEAVING SOME OF THE ORIGINAL SOUND BITES IN FROM HIS FIRST INTERVIEW. 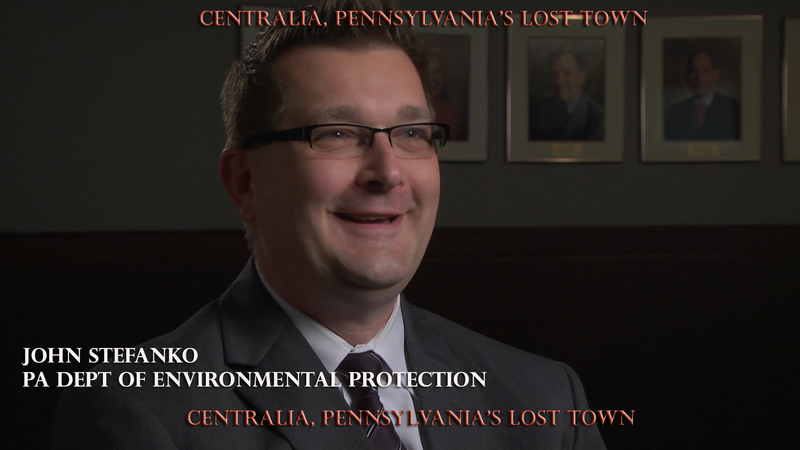 JOHN STEFANKO INTERVIEW – HIS ENTIRE INTERVIEW WAS RESHOT A YEAR AND A HALF LATER AFTER HIS FIRST INTERVIEW WAS ACCIDENTLY ERASED FROM A STORAGE DRIVE COSTING PRODUCTION AN ADDITIONAL $875.00 FOR THE RE-SHOOT. 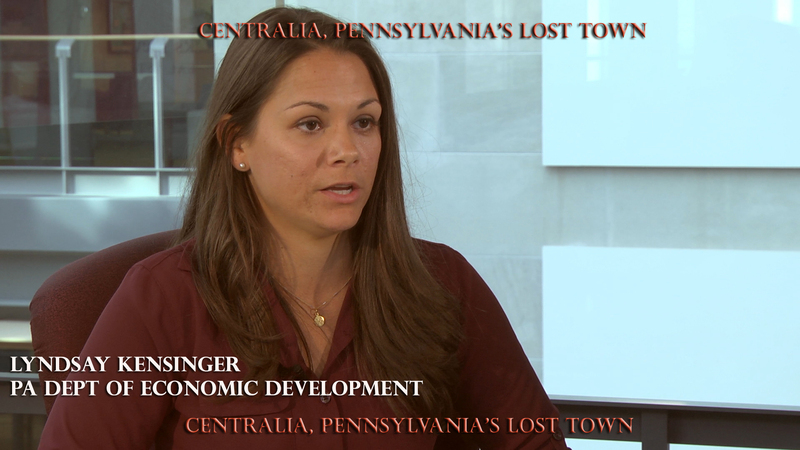 THE LYNDSAY KENSINGER INTERVIEW – THE ENTIRE INTERVIEW WAS CUT FROM THE DOCUMENTARY DEEMED USELESS BY EDITORS AFTER STATE LAWYERS GAVE HER YES & NO ANSWERS TO QUESTIONS ABOUT CENTRALIA. 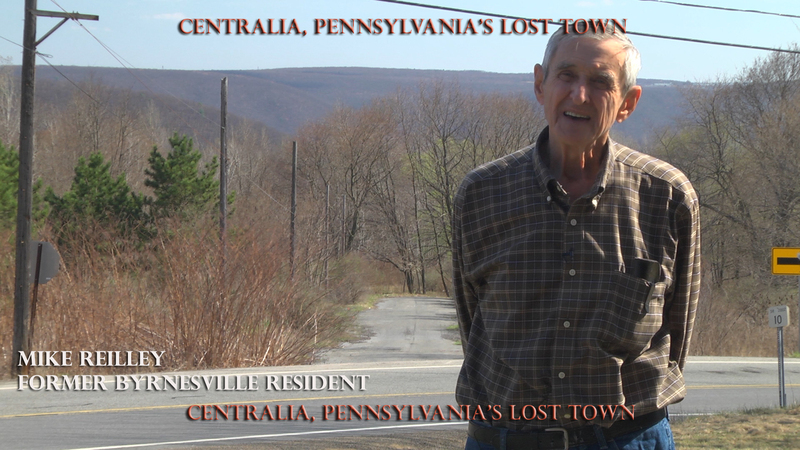 BYRNESVILLE RESIDENT MIKE REILLEY WALK & TALK INTERVIEW OUT IN BYRNESVILLE – CUT FROM THE FILM. 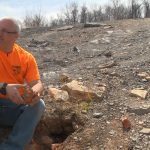 BRIAN SULLIVAN – ASSISTANT CAMERA & CAMERA OPERATOR SLATES FORMER BYRNESVILLE RESIDENT PAT ROONEY ABOUT THE TIME CAPSULE, CUT FROM FILM ALONG WITH NEWS FOOTAGE & 2015 VIDEO. 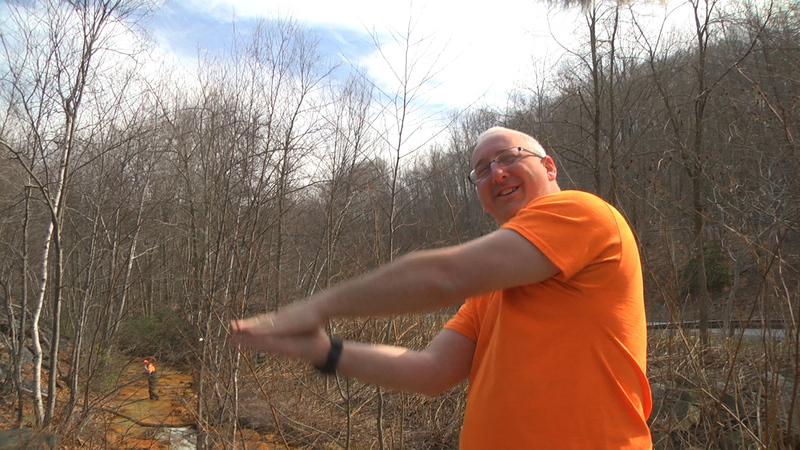 BRIAN ALSO SHOT ALL THE TIME LAPSE FOOTAGE SHOWN BETWEEN SEGMENTS. 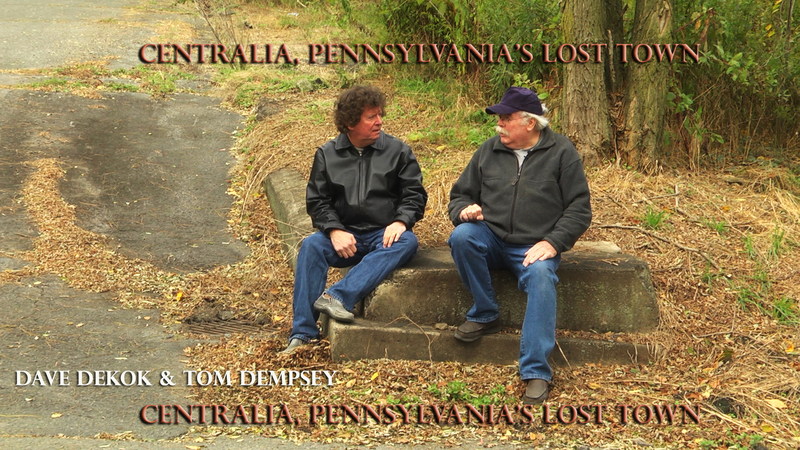 DAVE DEKOK & TOM DEMPSEY, THE TWO DRIVING FORCES BEHIND CENTRALIA’S STORY AND WHO CONSULTED ON THE FILM THROUGHOUT ITS COURSE. 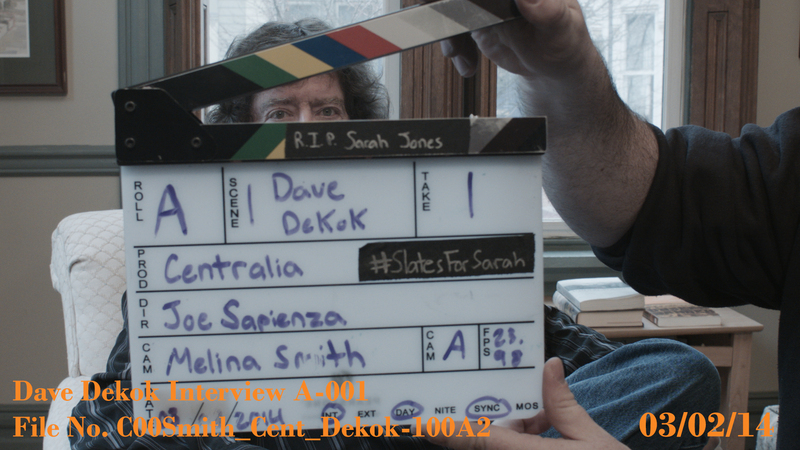 DAVID DEKOK-PEERS THROUGH THE SLATE READY FOR HIS INTERVIEW AT HIS HOME. 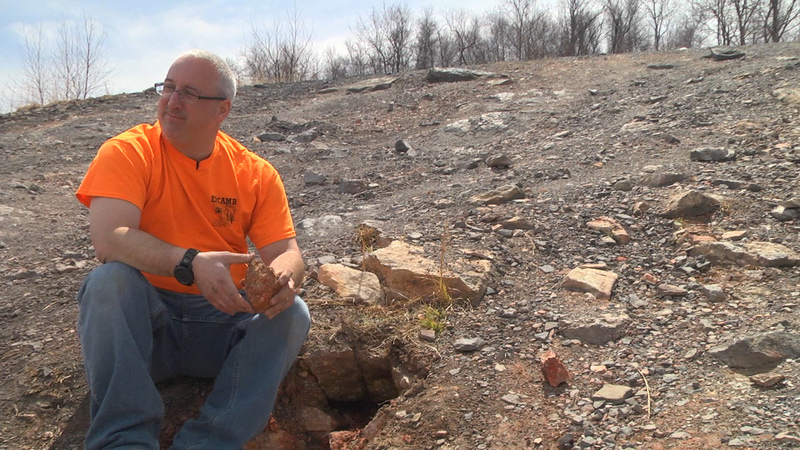 ROBERT HUGHES OF THE NON-PROFIT EPCAMR– INTERVIEWED AT THE CENTRALIA MINE TUNNEL. 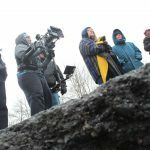 ROBERT HUGHES OF THE NON-PROFIT EPCAMR – WAS INTERVIEWED SEVERAL TIMES FOR THE DOCUMENTARY AND WAS A BIG PART OF ALL FOUR CENTRALIA CLEAN-UP EFFORTS SINCE 2014. 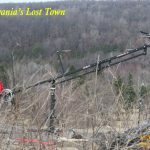 ONLY ONE LONG INTERVIEW PORTION OF HUGHES SITTING BY STEAM GUSHING FROM A HOLE ON THE HILLSIDE OF CENTRALIA WAS CUT FROM THE FILM. A NEW TV SERIES ABOUT HUGHES AND HIS TEAM AT EPCAMR IS IN PRE-PRODUCTION BY SAPIENZA. 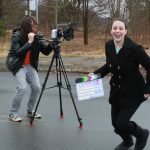 KIMBERLY SCHWARTZ – ASSITANT DIRECTOR AND ASSISTANT PRODUCER AT THE 2013 SCOUT AT THE LEGION IN WILBURTON, PA. SHE WENT ON TO WORK AT ABC NEWS AND NOW AT THE PURCH GROUP AS AN EDITOR & PRODUCER. 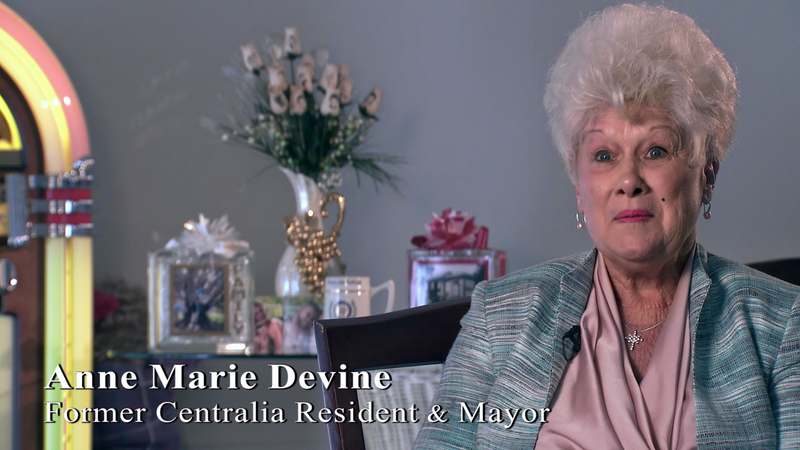 FORMER RESIDENT & MAYOR – ANNE MARIE DEVINE. 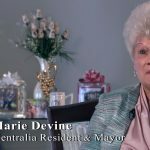 SAPIENZA WAS DETERMINED TO INTERVIEW ANNE DEVINE AND HE FINALLY ACCOMPLISHED IT IN SEPTEMBER 2016. 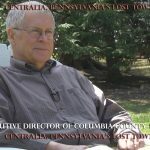 JUST BEFORE THE EDITORS HAD A FINAL MASTER VIDEO OF CENTRALIA COMPLETE, SAPIENZA ASKED THEM TO LEAVE OPEN BLANK SPACES WITHIN THE ENTIRE EDIT AT CERTAIN POINTS IN THE FILM WHERE HE KNEW ANNE’S INTERVIEW WOULD BE CUT IN, ESPECIALLY DURING THE EMINENT DOMAIN PROCEEDINGS. 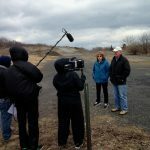 JOE SEEKED OUT ANNE BACK IN 2014 WHEN ONE PRODUCER ASKED HER FOR AN INTERVIEW, BUT SHE SAID NO, THEN IN APRIL OF 2015 PAT ROONEY (ALSO IN THE FILM UNDER BYRNESVILLE) CONFRONTED ANNE AND SHE AGAIN SAID SHE DIDN’T WANT TO TALK ABOUT CENTRALIA. 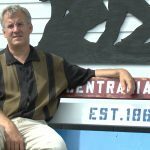 EVEN IN JULY OF 2016 DURING THE 150TH CENTRALIA REUNION, SHE AVOIDED SAPIENZA AS HE POLITELY AGAIN, ASKED HER FOR AN INTERVIEW. 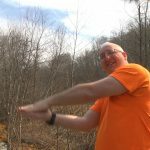 AFTER HE FILMED THE ENTIRE 150TH REUNION EVENT, HE EDITED THE REUNION WITH MUSIC TRACKS AND INTERVIEWS AND MAILED OUT OVER 200 DVDS TO PEOPLE WHO ASKED FOR A COPY, ALL FREE OF CHARGE. IT WAS AT THAT POINT HE RECEIVED A LETTER FROM ANNE DEVINE TELLING HIM TO COME TALK TO HER WHEN HE HAD TIME. SHE WAS IMPRESSED FOR WHAT HE DID WITH THE REUNION VIDEO. 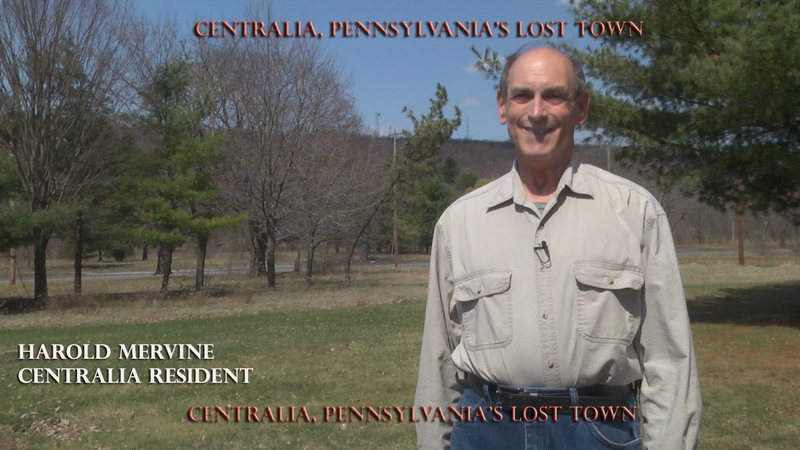 HE ARRANGED HIS SCHEDULE AND GOT HER ON CAMERA TO TALK ABOUT HER TIME IN CENTRALIA AND WHAT A POWERFUL FORCE SHE WAS DURING HER TIME AS MAYOR THERE WITH THE BATTLE OF EMINENT DOMAIN UNDER GOVERNOR BOB CASEY. 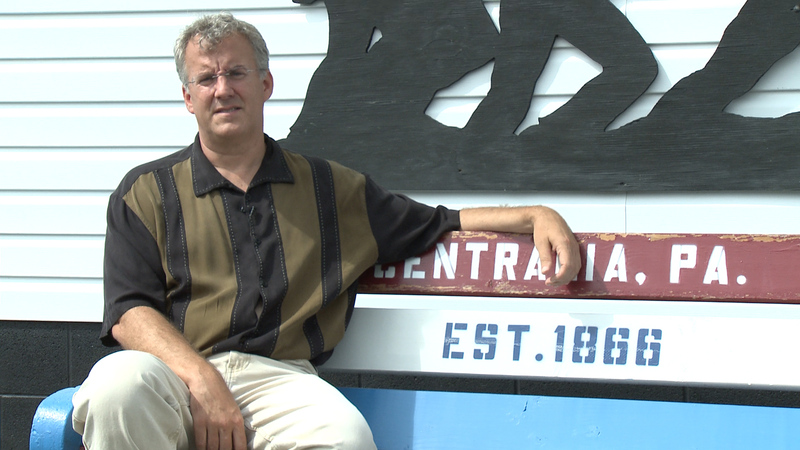 AFTER THE INTERVIEW, THEY’VE BEEN FRIENDS EVER SINCE AND SAPIENZA WILL DONATE A PORTION OF THE THEATER TICKET SALES TO THE CENTRALIA LEGION AS A THANK YOU. L-R: IAN JABOUR SOUND OP, DIRECTOR JOE SAPIENZA, CAM OP MELINA SMITH – INTERVIEW DAVID DEKOK AT HIS HOME. 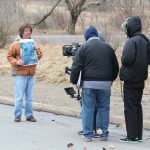 FROM A 3 HOUR INTERVIEW, ONLY ABOUT 23 MINUTES WAS USED THROUGHOUT THE DOCUMENTARY. 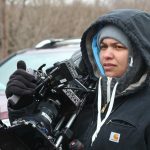 MELINA NOW WORKS AS AN ASSISTANT COLORIST FOR COMPANY 3 AND WAS THE COLORIST FOR THE DOCUMENTARY, A PROCESS THAT TOOK ABOUT THREE MONTHS, MATCHING ALL SEVEN CAMERAS TO MAKE THE ENTIRE DOCUMENTARY LOOK LIKE ONE CONTINUOUS MOVIE. 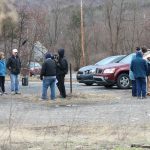 INTERVIEW WITH PART OF THE CODDINGTON FAMILY – LOCATION OF WHERE THEIR HOME ONCE STOOD. 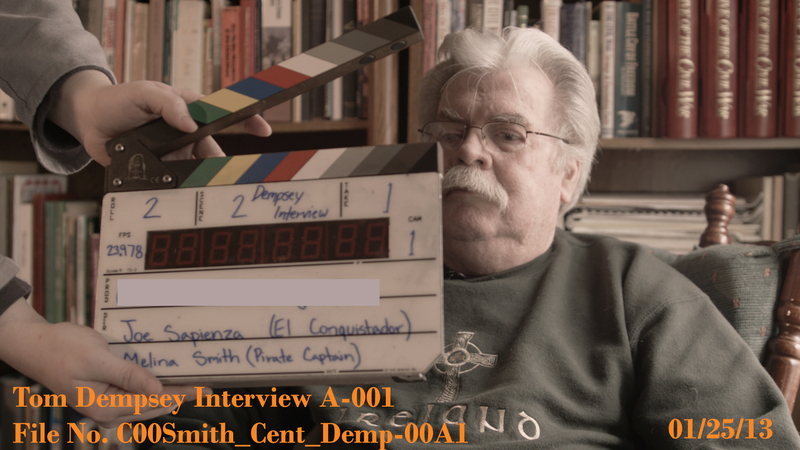 THIS ORIGINAL INTERVIEW BECAME CORRUPT FROM A HARDDRIVE, AND WAS LOST FOR GOOD, THANKFULLY THEY AGREED TO AN ADDITIONAL INTERVIEW. 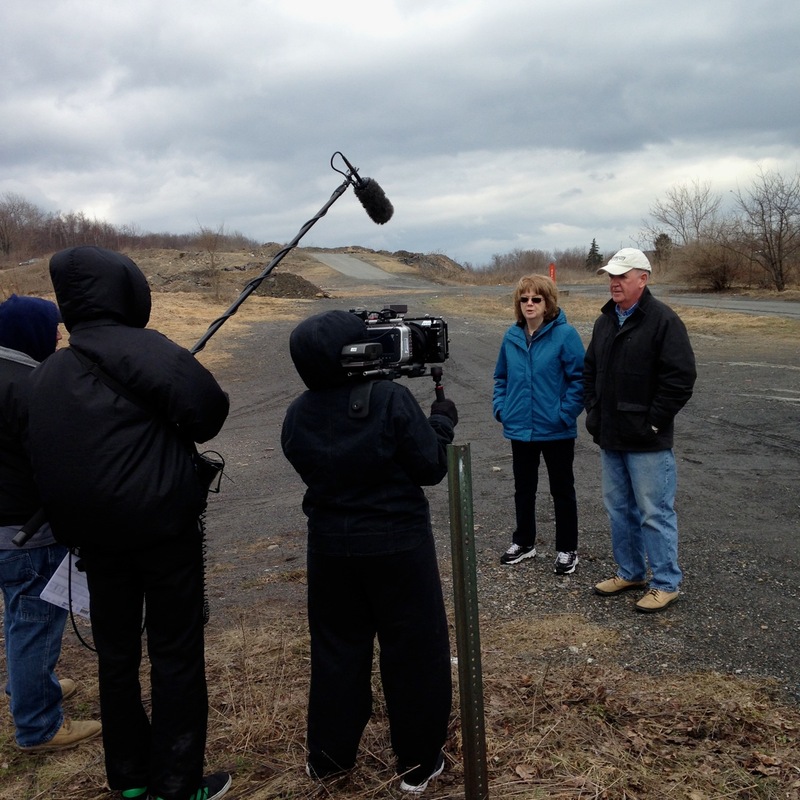 ASSISTANT DIRECTOR KIM SCHWARTZ SLATES TOM DEMPSEY INTERVIEW AT THE FORMER POST OFFICE IN CENTRALIA. 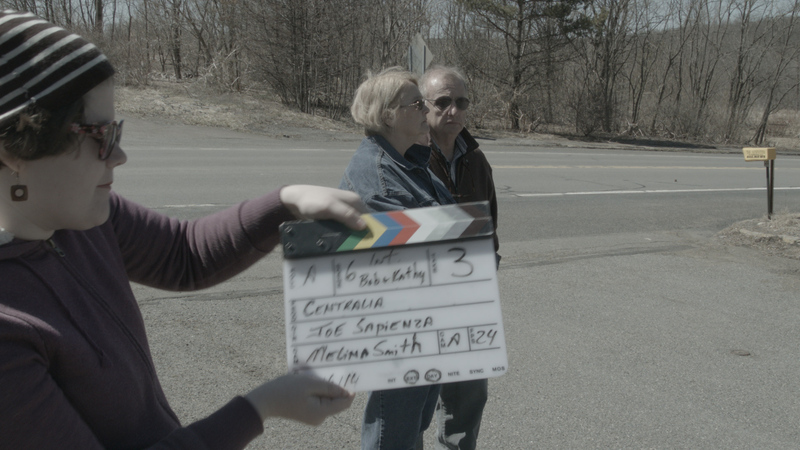 PRODUCTION ASSISTANT ISABELL DZWONCZYK – SLATES THE GADINSKI FAMILY AT THE FORMER LOCATION OF THEIR HOUSE. 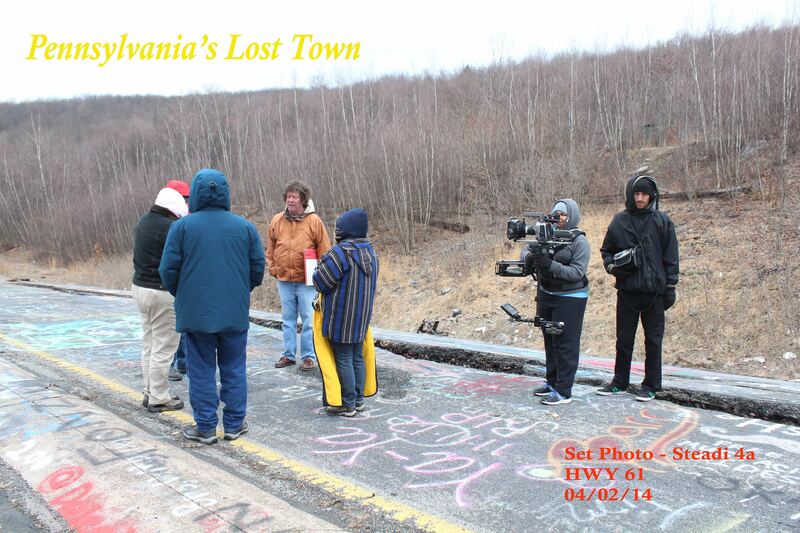 ISABELL IS COLLEEN CODDINGTON’S DAUGHTER AND ISABELL BROUGHT HER FAMILY OUT TO CENTRALIA AND IS SOLEY RESPONSIBLE FOR KICKING OFF THE FIRST FAMILY TO BE INTERVIEWED AND TO CHANGE THE COURSE OF THE SHORT FILM – AMERICA’S LOST TOWN. THE JOHN LENNON SONG- GIMMIE SOME TRUTH WAS TO BE USED AS AN OPENING SONG FOR THE SEGMENT TO THE CODDINGTON FAMILY BUT WAS CUT DUE TO LICENSING FEES. 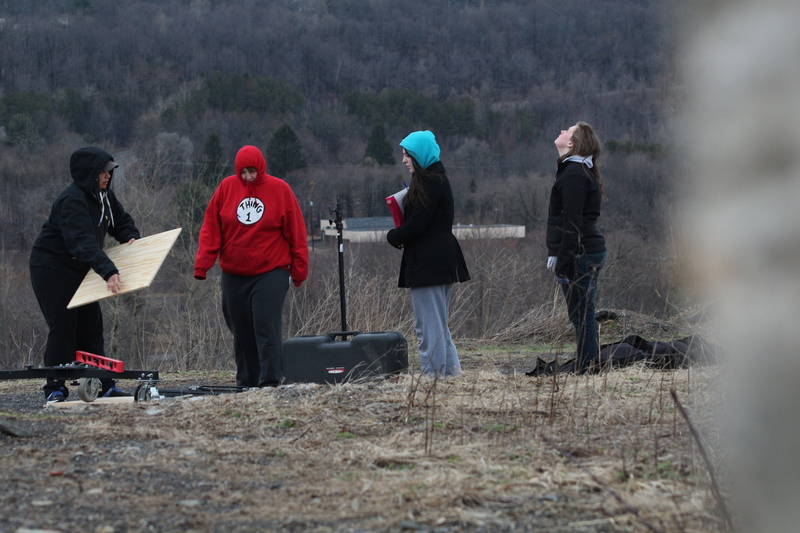 THE OPENING JIB SHOT THAT SAT ON TOP OF THE HILL THAT OVERLOOKS CENTRALIA. 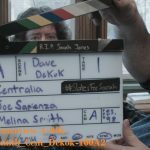 A SCENE WITH DAVE DEKOK WAS SHOT WHICH WAS TO BE THE ORIGINAL OPENING FOR BOTH THE SHORT AND EXTENDED FEATURE, BUT WAS NEVER USED. 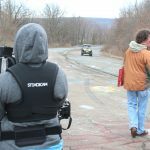 THE DAVE DEKOK TOUR WITH MELINA SMITH BEHIND THE STEADICAM, A 45-MINUTE-LONG UNCUT SCENE AROUND PORTIONS OF CENTRALIA THAT DIDN’T MAKE THE CUT INTO PENNSYLVANIA’S LOST TOWN. 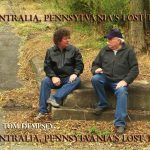 TOM DEMPSEY INTERVIEW, FORMER RESIDENT & POSTMASTER OF CENTRALIA. 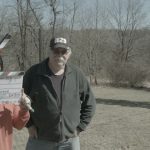 THE VERY FIRST INTERVIEW AT TOM’S HOME. 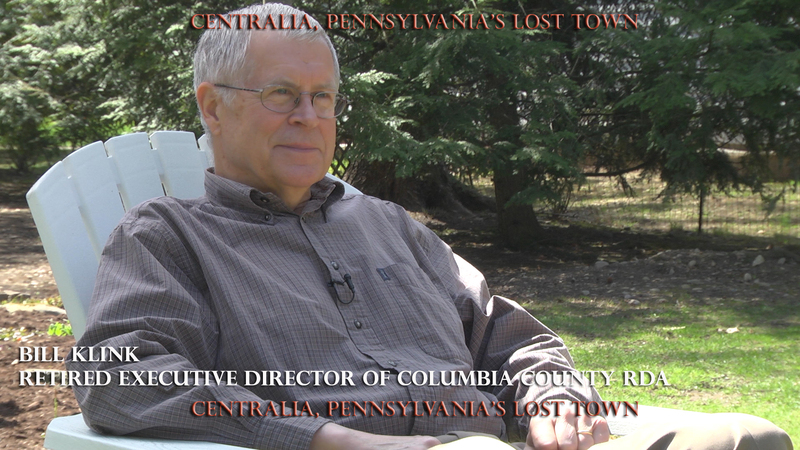 TOM CONTRIBUTED TO THE FILM BY NOT ONLY IN THIS INTERVIEW, BUT HE CAME OUT TO CENTRALIA THREE TIMES; ONCE AT CERTAIN LOCATIONS WHICH WERE USED IN THE FILM, A DRIVE AROUND TOWN WHERE HE POINTED OUT WHERE THINGS USED TO BE, THAT FOOTAGE WAS NEVER USED, AND THE WALK & TALK AROUND CENTRALIA WITH DAVE DEKOK. 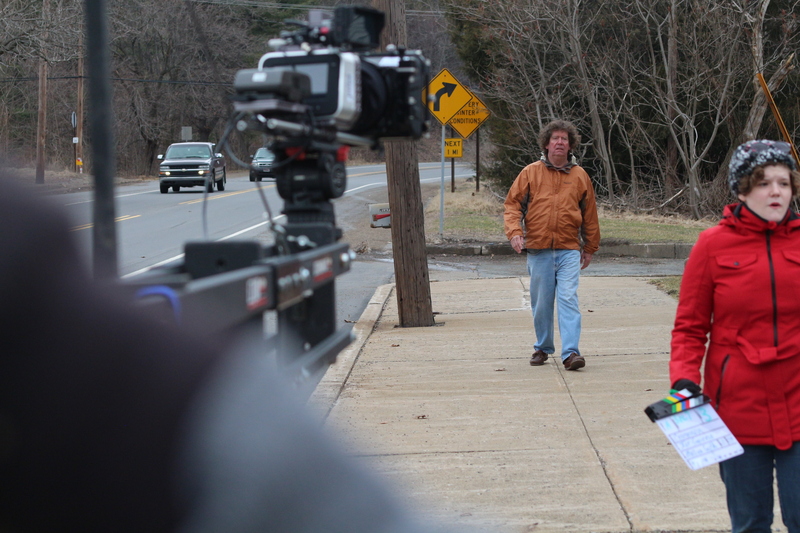 TOM ALSO SUPPLIED MANY PHOTOS AND A SHORT NARRATION TRACK FOR THE FILM AND SERVED AS A CONSULTANT. 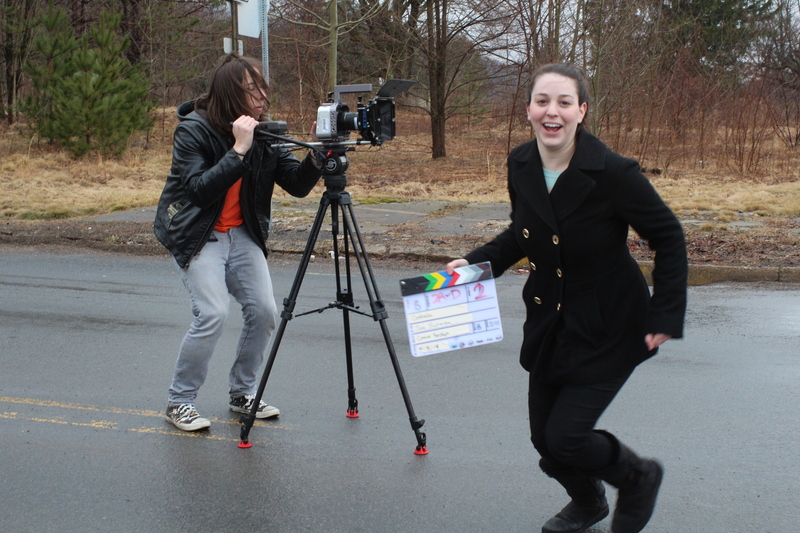 ASSISTANT DIRECTOR KIMBERLY SCHWARTZ AND CAM-OP CONNOR BORDIGA IN THE MIDDLE OF CENTRE STREET/HWY 61 SHOOTING DOWN THE STREET- SOMETIMES YA JUST GOTTA DO WHAT YA GOTTA DO TO GET THAT SHOT! 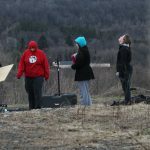 OPENING JIB SHOT SET-UP ON TOP CENTRALIA’S HILL. 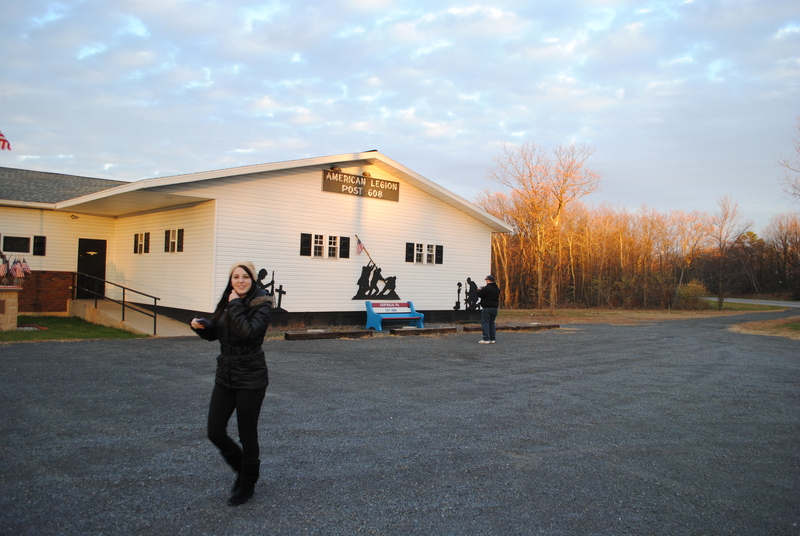 INTERVIEW SHOTS WITH THE CODDINGTONS AT THEIR FORMER LOCATION. INTERVIEW SHOTS WITH THE CODDINGTONS AT THEIR FORMER RESIDENCE. 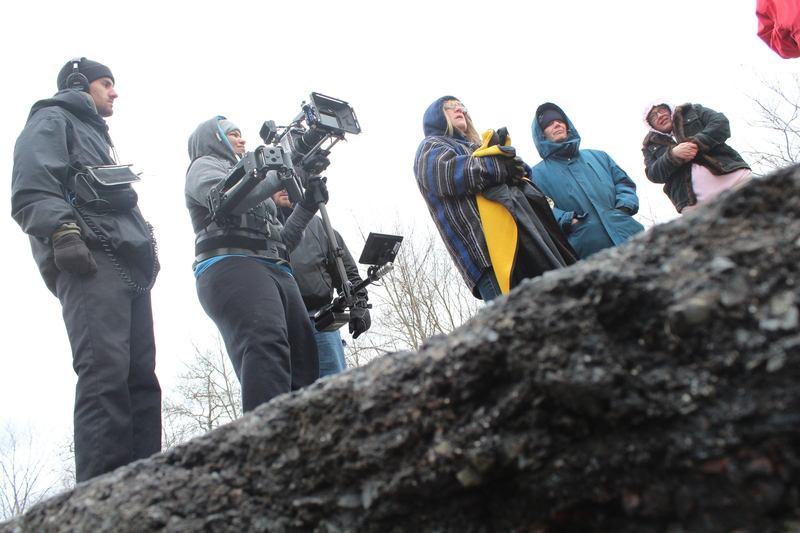 OPENING JIB SHOTS ON TOP CENTRALIA’S HILL. 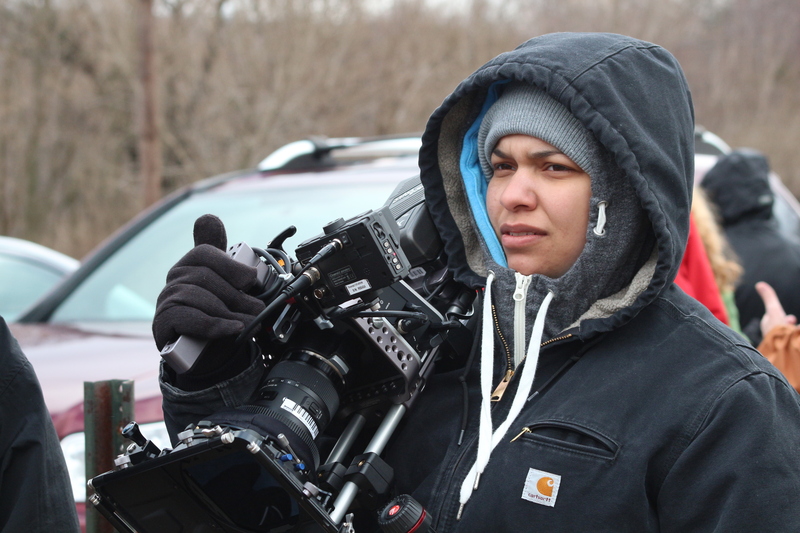 STEADICAM-OP MELINA SMITH WITH WALK TOUR ALONG WITH DEKOK ALONG HWY 61. 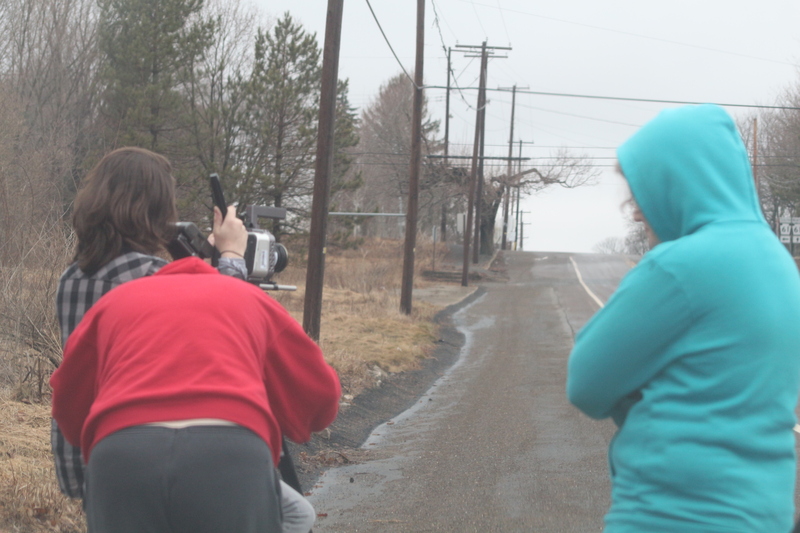 STEADICAM-OP MELINA SMITH WITH WALK TOUR ALONG WITH DEKOK ALONG HWY 61 THAT WAS CUT. 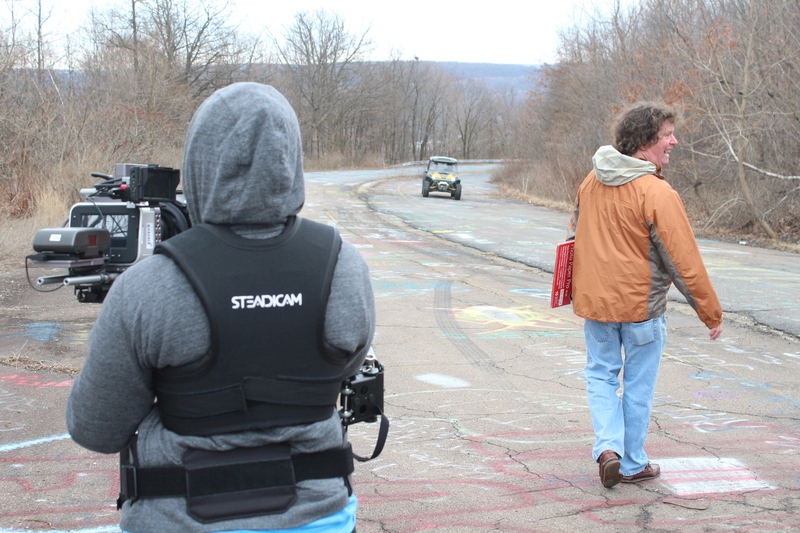 STEADICAM SHOT WITH DAVID DEKOK ALONG THE CRACK AT HWY 61. CAMERA-OP MELINA SMITH SHOOTS DAVE DEKOK ACROSS THE MUNICIPAL BUILDING THAT WAS CUT. 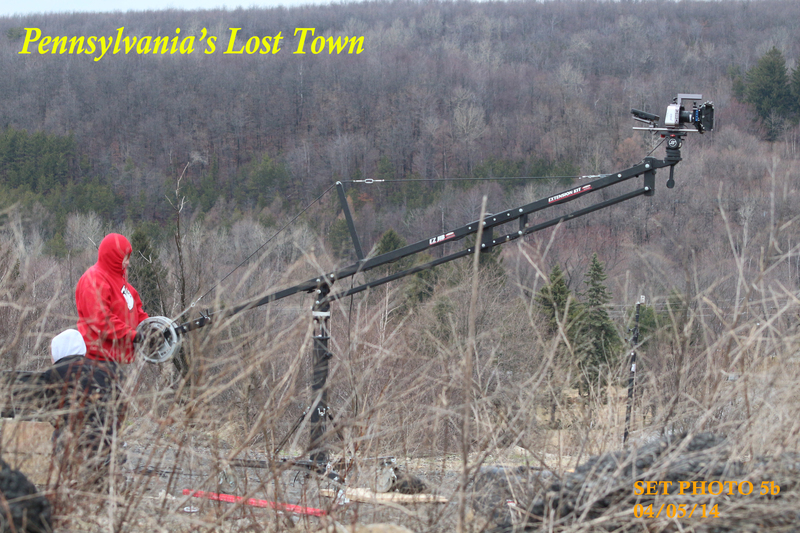 ONE OF THE CRANE SEGMENT SHOTS AT THE MUNICIPAL BUILDING THAT WAS CUT. 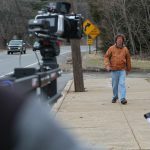 B-ROLL SHOOT OF AN OLD WOODEN FENCE (SHOWN IN THE OPENING CREDITS) OFF RT 42 WHERE HOMES ONCE STOOD. 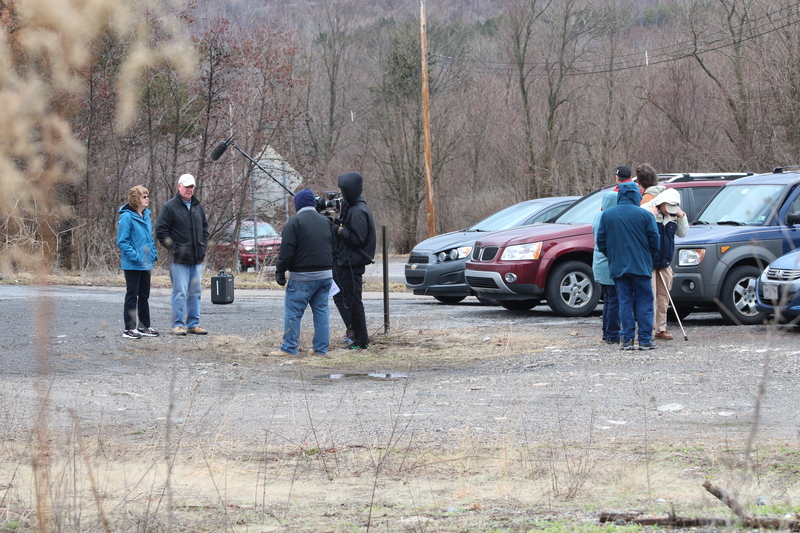 DOLLY SHOOT WITH CONNOR BORDIGA ALONG RT 61 ACROSS FROM THE HYNOSKI RESIDENCE. 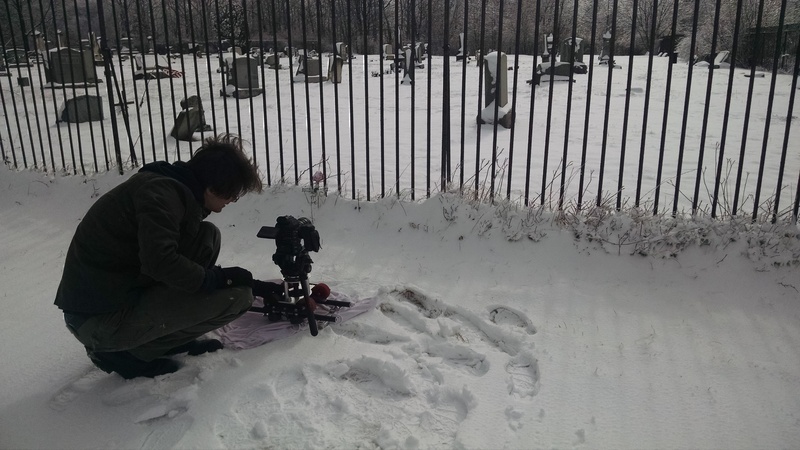 CAMERA-OP TOM MACOY SHOOTS A SCENE FOR THE ODD FELLOWS CEMETERY AND LOCATION WHERE THE FIRE ORIGINATED. 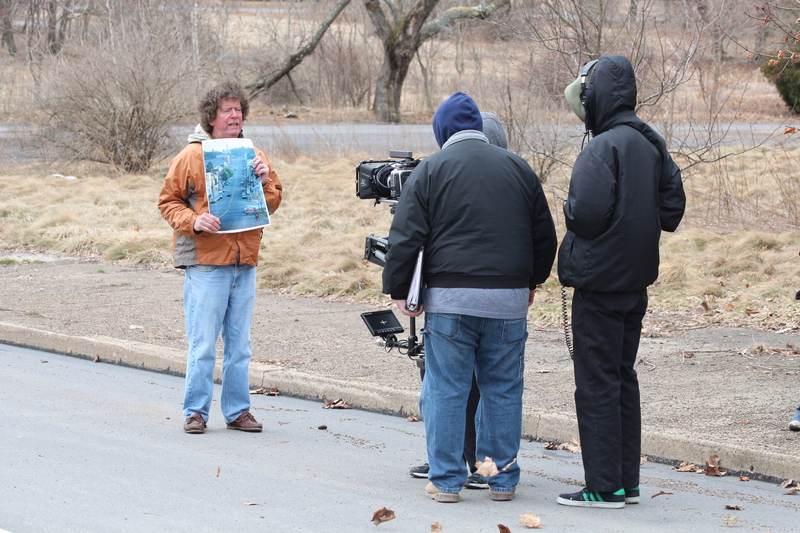 WALK & TALK INTERVIEW SHOT WITH DAVE DEKOK & TOM DEMPSEY ALONG PARK AVE WHERE MANY HOMES ONCE STOOD. 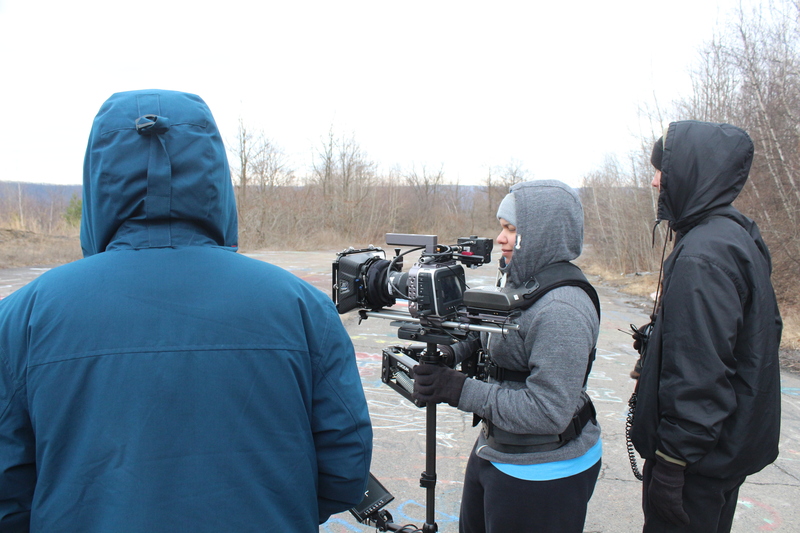 L-R: KIM SCHWARTZ ASSISTANT DIRECTOR, KAYLA HOOVER GRIP, & SECOND CAMERA CONNOR BORDIGA FILM ONE OF THE OPENING DOLLY SCENES ACROSS A VACANT STREET. 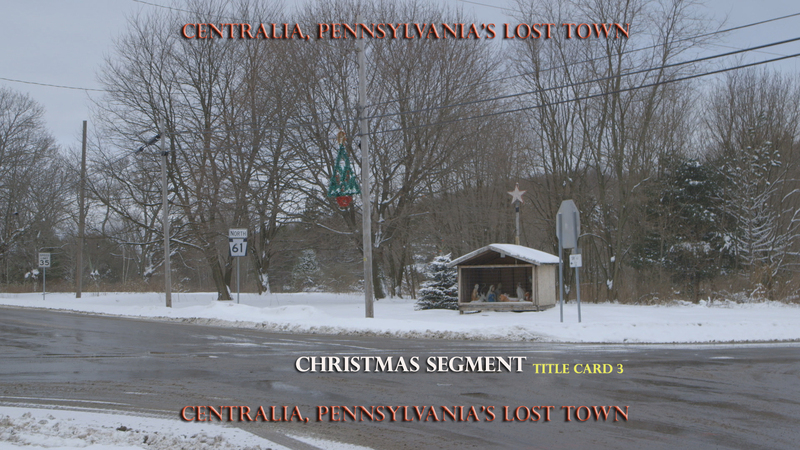 THE CHRISTMAS IN CENTRALIA SEGMENT THAT WAS CUT FROM THE FILM.